With more than 90 years of successful operation under its belt, it’s easy to say that Midland Metal Products is doing something right. Ask owner and facility director B.J. McDonald what the underlying driver is behind nearly a century of doing business, and he’ll tell you it has to do with the company’s traditional values. But in that same breath, he’ll also attribute the company’s long run to how it embraces technology. 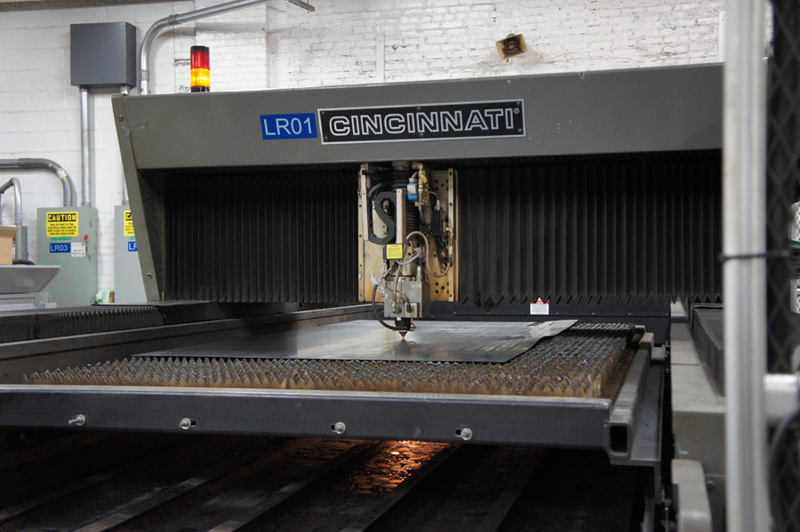 Two lasers from Cincinnati Inc., a CO2 707 for 5-ft.-by-10-ft. dual pallets and a CO2 840 also for 5-ft.-by-10-ft. dual pallets, process a variety of sheet metal for Midland Metal Products, located in Chicago. Although Midland Metal Products has come a long way since first opening its doors, the company still embraces a traditional approach to the capital expenditures required for its impressive mix of equipment. In addition to its two lasers, it has two turret punches, 20 press brakes, 38 resistance welding stations, two CNC 3-D wire bending cells, 16 MIG welding cells, two robotic MIG/TIG welding cells, two 5-axis tube lasers, four CNC tube bending and rolling cells, and a fully automated powder coating spray booth. So in addition to justifying the purchase, he also had to promise an aggressive ROI. His family was counting on him. McDonald represents the fourth generation of the private family-owned business, which was founded by his great grandfather. 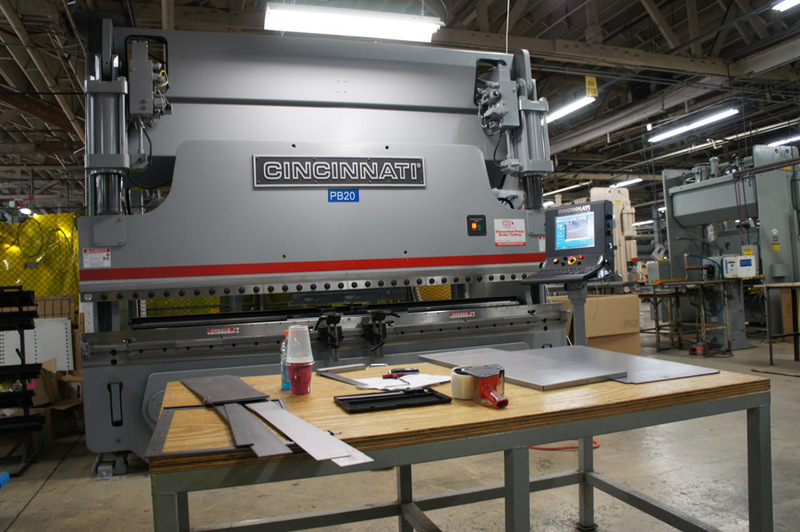 In addition to its two Cincinnati lasers, Midland Metal Products has a wide range of equipment, including 20 press brakes. Being responsible for the facility and the overall operations of the organization, McDonald had to answer the question of how a new laser machine could be paid back in two to three years. “I had a hard time proving that a standalone machine could do it in short order, so it was quickly determined that the laser had to run 24 hours a day,” he explains. “So how are you going to that? You’d have to add people and management to shifts that you didn’t have before. It made more business sense to spend more for a material handling system that could shorten the payback of the laser. Located in a 110,000-sq.-ft. facility in working-class Bridgeport on Chicago’s South Side, the company primarily serves the POP, or point-of-purchase, advertising display market. It’s a custom job shop that handles medium- to high-volume custom store display fixtures. The company is fully capable in sheet metal, tube and wire, which gives Midland Metal Products a competitive edge in the marketplace. Thanks to its sophisticated collection of equipment, the company can handle all of the main types of material – even wood. The company also provides assembly for its customers as well as powder coating, making it a full-service custom job shop. Based on tonnage, McDonald says that 90 to 95 percent of the material it processes is commercial-quality cold-rolled steel or mild steel. The other 5 to 10 percent is a mix of brushed aluminum for signage as well as stainless steel. 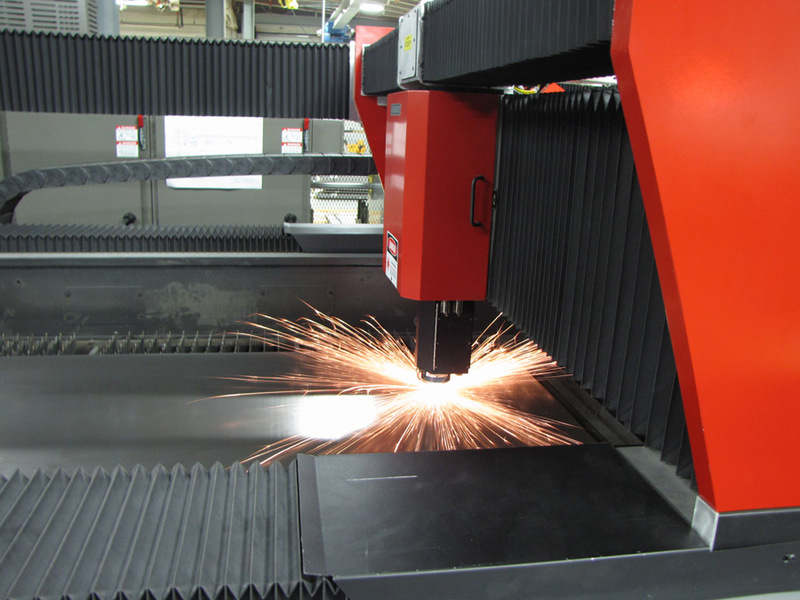 In terms of making the most of its laser technology, Midland Metal Products currently uses shop air for cutting – an incredibly cost-effective way to run a laser machine. The company uses it exclusively for up to 12-gauge material. The large automation system McDonald referred to is Cincinnati’s Modular Material Handling System, or the MMHS, coupled with a material storage tower. As the predecessor to the current Cincinnati version, the MMHS-100, the MMHS is a flexible and expandable system. It can handle sheet from 20 gauge up to 1/2 in. thick for sheets that measure 5 ft. by 10 ft. and 6 ft. by 12 ft.
Midland Metal Products primarily serves the POP, or point-of-purchase, advertising display market, creating medium- to high-volume custom store display fixtures. As McDonald mentioned, the goal for bringing in the system was to improve the ROI of the new laser as well as increase overall shop capacity. According to Cincinnati, automation does that and more. Automation, such as the type at Midland Metal Products, can also reduce operating costs and increase safety. Cincinnati has various options available that can speed up the time for loading material, including an additional model that also sorts cut parts. Otten notes that with the ability to simultaneously pick up multiple parts, the system improves productivity by removing and sorting parts faster than doing so manually. He says that productivity is further enhanced when the cycle time of a nest is relatively fast. With the material handling systems – no matter the variety – operator involvement is minimal. Otten says one requirement for operators is to populate the control of the material warehouse with information about material type, sheet size and quantity pertaining to each raw material drawer. However, the introduction of automation doesn’t mean that operators aren’t needed. Midland Metal Products new automated powder coating station is a good example of that. Midland Metal Products currently has two Cincinnati Inc. CO2 lasers on its shop floor with plans of a fiber laser investment on the horizon. McDonald is incredibly proud of the team at Midland Metal Products and stresses that everyone is a part of that team for a reason. When it comes to bringing new technologies in house, McDonald doesn’t look at a piece of equipment as a standalone investment. He sees every aspect of the company’s operations as part of an overall system. This viewpoint helped drive the adoption of another Cincinnati product, its CI Scheduler. The Scheduler software package does what one might expect. It schedules and nests parts on one or more lasers, similar to an MRP system. It is, therefore, the perfect complement to the Modular Material Handling System that Midland Metal Products is leveraging. But, it also works well with lasers not integrated with automation. When coupled with the MMHS, the CI Scheduler receives job completion information from the system and shares that information to automatically track material inventory. Cincinnati Inc.’s Modular Material Handling System, or MMHS-100, similar to the one residing at Midland Metal Products, is flexible and expandable and can be integrated into one or more Cincinnati laser systems. So not only did the company achieve its aggressive goals for ROI as well as shorter leads times, it also eliminated 30 to 40 OBI punch presses with its two lasers. Essentially, Midland Metal Products’ outcome paints the ideal picture of what happens when traditional business values and cutting-edge technology come together.